Ah, the good ol’ emotional Once Upon A Time has come back to give us the feels at just the right time. Zelena’s past actions as the Wicked Witch are coming back to haunt her again in the present, and plenty of questions finally get answered. This episode was the perfect time for Lana Parrilla to make her directorial debut on the show, and she did a great job presenting this very important episode for her onscreen sister. Zelena is the prime focus of the episode, and her past and present are heavily featured. In the present, Zelena is being hunted by the Candy Killer. Once Rumple tells her that the killer is Hansel, Zelena knows exactly why she is the next target. Thankfully, there are flashbacks aplenty that actually are helpful and further the plot. The action picks up in Oz, where Zelena is still in full-green Wicked Witch mode. I didn’t think we were going to get to see the Wicked Witch again before the series ended, so these flashbacks were a very pleasant surprise. Evil Zelena is attempting to rid Oz of all other witches and happens across a gingerbread house where tweens Hansel and Gretel are being held hostage. Yes, we have seen other iterations of Hansel and Gretel and their story before on this show. Apparently, everything we saw previously in the series doesn’t hold up, so just pretend like this is the correct story to make it easier on the brain. Zelena decides to battle the witch holding the kids captive rather than free them, showing off her bad side. She is injured in the fight and is found unconscious in the woods by the kids’ blind father. The father nurses Zelena back to health and sees the goodness that is deep inside her. Zelena likes the attention too much and doesn’t even tell him that she knows where his children are. By the time the guilt has gotten to her, Zelena arrives at the gingerbread house a little too late: Hansel and Gretel are no longer there. Zelena decides to take the witch’s sight and give it to the father to make amends, but Hansel and Gretel have beaten Zelena home and told their father the truth. When the father wants her gone, Zelena can’t control her irrational feelings toward the family. Hansel steps up to make Zelena go, but her rage consumes her and she casts fire to wrap around Hansel’s arms. We now know why Hansel wants Zelena dead, why he hates witches in general, and how he got his scars. It’s not surprising that he goes after Zelena in Seattle, but it is odd that he never tried to get back at her when they met again in the fairytale realm. Hansel makes several remarks in the present timeline about knowing Zelena well and that she knew him as Jack. He has had plenty of time to get his revenge, so it is a little weird that he waits until now to strike. Zelena gets overly emotional again when Hansel takes her fiancé, Chad, hostage to force her hand. Poor Chad has a rough time in his debut, as he learns most of the truth about Zelena and her past and witnesses a pretty great brawl. Hansel comes after Zelena with a knife in the basement of the bar, but Zelena is prepared for combat. After some nice fighting, Zelena manages to get the knife and presses it to Hansel’s throat. He urges her to kill him, but Zelena proves once and for all that she has changed and is no longer wicked by knocking Hansel out. Zelena calls the police and has Hansel arrested, which is impressive given her past track record. Even after he learns the truth, Chad decides that he still loves Zelena and wants to be with her. Their engagement is still on, and Zelena decides to go back to San Francisco with him. 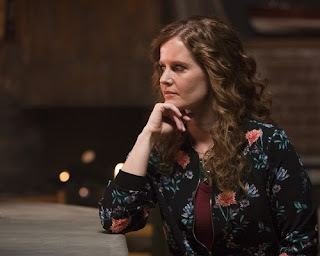 Zelena and Regina have an emotional goodbye, but given that the curse is still intact and that there are unresolved family connections in Seattle, this doesn’t appear to be the last time we will see Zelena. It is likely that Zelena will return for the series finale when the curse is, presumably, broken. In the meantime, it’s really nice that Zelena is finally getting her happy ending and a chance to start over with a new life. She has earned the right to be happy, so I couldn’t be more thrilled with how her story has played out this season. While there were several smaller subplots sprinkled throughout the episode, only one is truly important. Facilier is back in Seattle and causing havoc, per usual. However, his crazy scheme is coming to fruition in surprising ways. We know that Facilier is trying to get Rumple’s dagger and become the Dark One and that he is also using as many people as possible to do his dirty work. We didn’t know that Facilier was secretly waking up characters and forcing them to help him in return. It turns out that Facilier woke up both Prince Naveen and Hansel several episodes ago, which was pretty unexpected. There weren’t any hints that Naveen was awake when he was heavily featured a few episodes back, and it was more likely that Hansel had somehow been awake the whole time rather than being woken up. Facilier is pretty smart because he wanted Hansel to take care of his witch problem, mainly with Gothel, for him. He also uses Naveen to get Sabine’s trust, which Facilier sprinkles on a voodoo doll. Yes, that part is a bit confusing, until he takes the voodoo doll out while talking to Hansel at the end of the episode and stabs it in the chest with a needle. Hansel keels over, so it looks like it’s the end of the road for him. It is also good that Facilier’s end game is in sight because his plan doesn’t have much time left to develop.